Rep. Jason Chaffetz (R., Utah) said Monday that he is a "definite maybe" for a cable news career once he officially leaves Congress on June 30. There's been talk that Chaffetz is going to Fox News—talk that he did not deny when he was on CNN a few weeks ago. Last night, Lemon tried to get a clearer answer from Chaffetz—who said his final day is June 30th—and asked, "Does your future involve any three letters or four letters? CNN, FNC, MSNBC…"
Lemon tried to get him to elaborate, but Chaffetz said, "More on that later." During his CNN appearance, Chaffetz largely discussed the charges being pressed by the Department of Justice against a federal contractor who reportedly leaked classified material to the media. 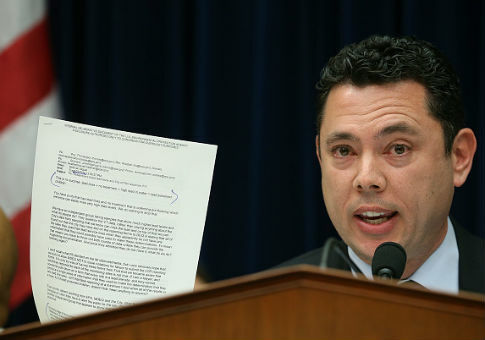 On Tuesday, Chaffetz was the "One Lucky Guy" on the Fox News show "Outnumbered." This entry was posted in Uncategorized and tagged CNN, Fox News, House Oversight and Government Reform Committee, Jason Chaffetz. Bookmark the permalink.